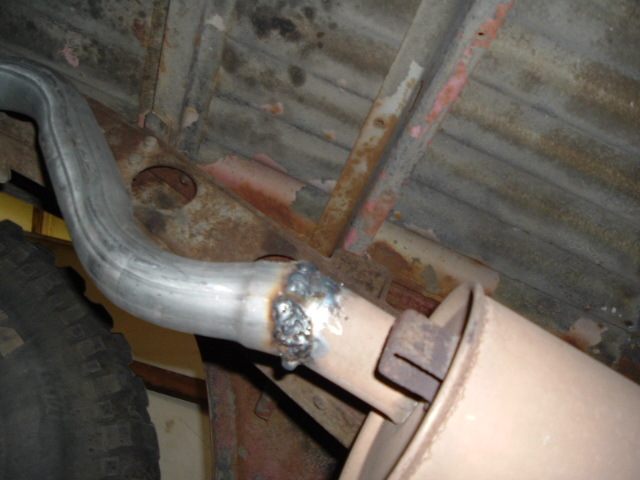 When I got my FJ45, it had no tailpipe, just a couple inches of stub coming out of the back of the muffler where the old one had apparently rusted through and broken off. 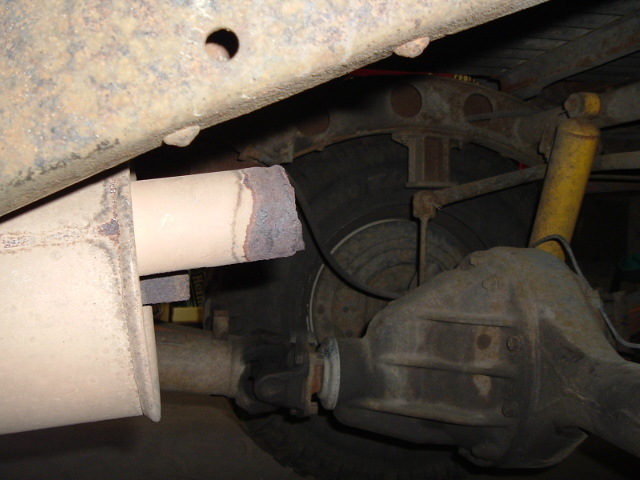 While it wasn't a major big deal that the exhaust was coming out from underneath the truck's bed instead of out the rear or side, I was worried that the muffler was only being supported by one hanger on the downpipe in front of it, and that it would eventually break off. I tried to order in an OEM tailpipe from my dealer, but found out that they are discontinued. So I took the truck up to my local muffler shop and had them bend one up custom. It cost about $80. Below, you can see all that was left of the old tailpipe. 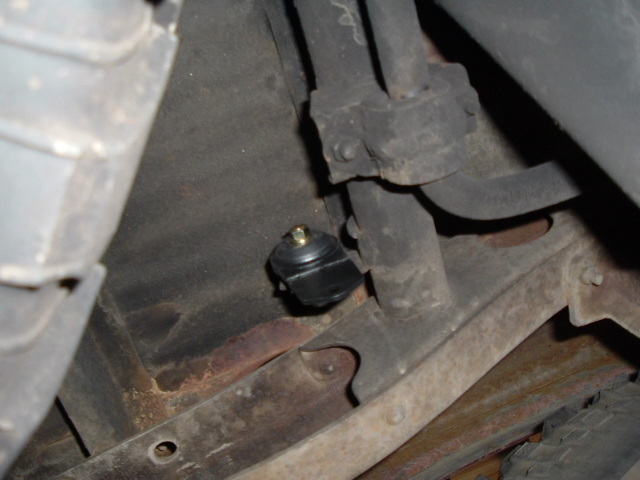 In the stock application, there would have been a square flange somewhere around there to bolt the stock tailpipe to. First, I ground off all the rust to get some nice clean metal to weld to. Fortunately it was still pretty thick. I bought an OEM hanger and hardware for the front mount to the tab coming off the frame. 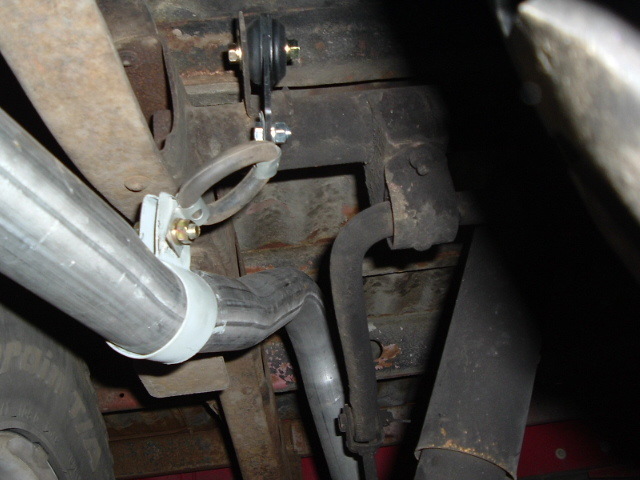 Since the OEM clamps are no longer available, I fabricated a pair just like the one I made for my 76 resto. They are painted with zinc cold galvanizing compound. 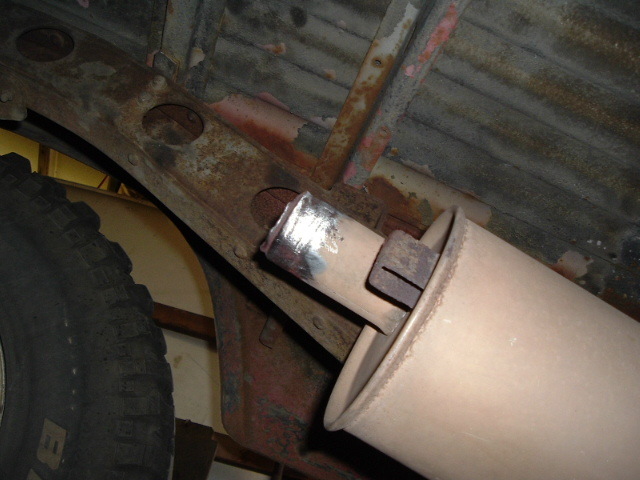 After I had the pipe nominally routed and supported, I welded up the tailpipe to the stub at the back of the muffler. Booger welds! But there was good penetration and it seems pretty solid. This was my first time welding on the underside of something and I sure learned a lot. One thing I learned was not to weld on your back with just a t-shirt covering your chest. I had put on a long sleeve shirt to cover my arms, but didn't button it. Ouch! Those falling sparks went right through the t-shirt! The rear hanger had to be angled back a bit to get the height right. 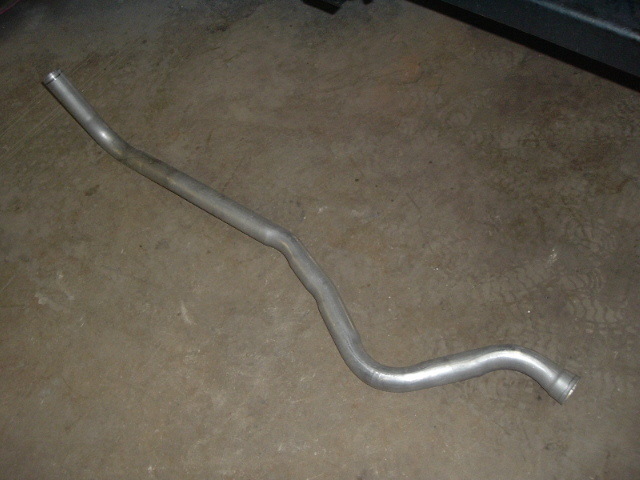 When we were bending the pipe, we didn't take into account the length of the hangers, as I hadn't ordered them in yet. 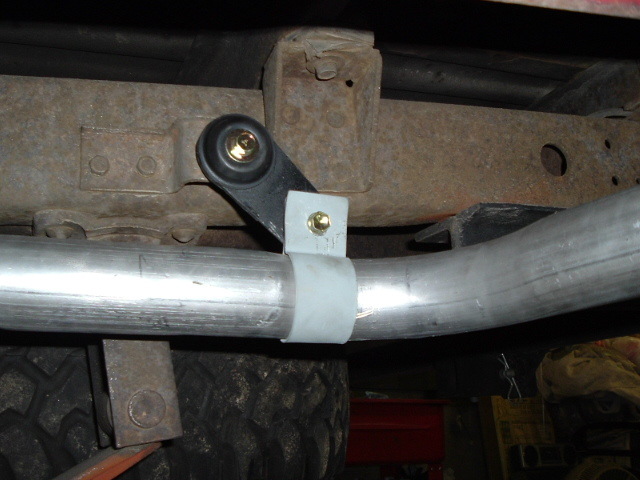 The front hanger didn't line up directly above the pipe, so I used an extra rubber donut, which is normally used on the hanger on an FJ40 which is just after the downpipe. I used some metal strap to clamp the donut to the hanger above and the clamp below. Here's another view of the hanger-donut-clamp. 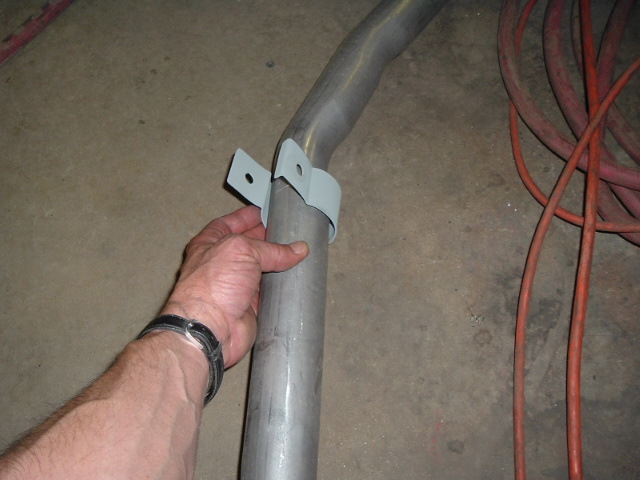 This allows the pipe to be well supported, but off center from where the hanger is mounted. 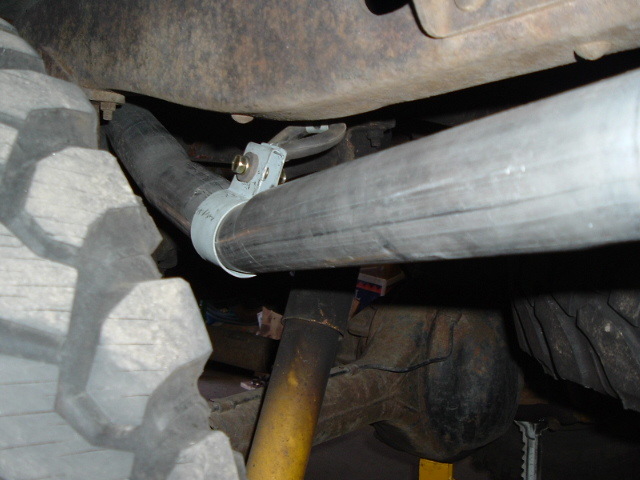 The installed tailpipe comes out along the left rear of the bed behind the tire just like the factory. The end is just about flush with the bed and it works really well. Hopefully it will last a very long time.